Serving Lake County and Porter County Since 1969! We offer a wide variety of newer model cars, vans, and SUV's. We also offer a full line of Penske moving trucks for local or one-way trips. A winner of the Neighbor's Choice Award 5 years running compliments our excellent customer service. Holiday Rent a Car wants to make your renting experience the most enjoyable. So whether you're traveling, or just hanging around town, we can get you on the road with the cheapest rate in town. At Holiday Rent a Car, you're treated like family. Let us know in the Testimonials Tab! 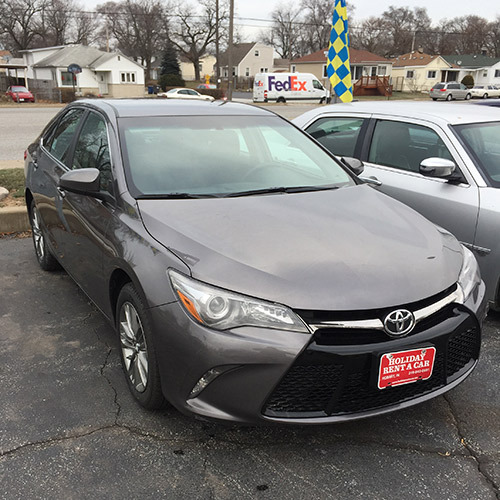 2017 Toyota Camry's are Here!! I just want to say Thank You, I was able to rent with Holiday Rent a Car, and I'm only 23 and they even let me pay with my bank card. All the ladies were really nice and I can't wait to rent with them again. I would send any of my friends to them! Thanks again Holiday!